Random Thoughts | "Northern Crossings"
The “news” is all aflutter over the planned meeting between the US and North Korea and of course there is the usual blather about how difficult negotiations are and how things like this should be left to the professionals who have talked about diplomacy and peace processes for fifty years and bring balladeers to major meetings to make sure folks know that “they have a friend” in the United States. These experts negotiate those complicated deals that allow nations to develop nuclear weapons all the while ruining their people and developing large armies that are malnourished and full of intestinal parasites. We send aid to folks who use the money to buy concrete, not to fix infrastructure, and work on things like, oh let’s say plumbing, but to build intricate tunnels so they can pop up out of the ground and kill innocent folks that they have some kind of grudge against. Maybe if those folks, instead of having “days of rage” , would have “days of indoor plumbing” life might get better. Now we are hearing that the folks that are making the whole world nervous because of their nuclear program and threatening nature, are attending the summit but cannot afford the hotel accommodations in Singapore. How can this be when President Bill Clinton who sent them billions of dollars to build the weapons in the first place, didn’t set aside a little bit for incidentals? Maybe we should ask John Kerry to use his personal fortune to feed and accommodate the North Koreans while in Singapore and maybe throw in a concert by James Taylor? That would take the onus off the American taxpayer and Kerry would actually accomplish something for a change. Of course the Clinton folks could pay for the whole trip for everyone involved and the expense would be a rounding error. Anyway, maybe folks from these past administrations that got us into these messes could help from the personal fortunes they have made in “public service”. Evidently the Obama’s have moved into a mansion that makes the White House look like one of the homes under the Palestinian Authority. Maybe they can make a donation. 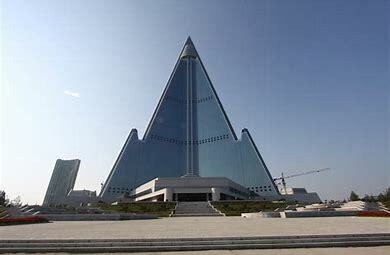 Anyway there may be a better answer, and that is have the summit in North Korea and hold it in the largest abandoned building in the world, the “Hotel of Doom”. Look it up. Hope for the Hopeless part 2 – 1st Corinthians 15:19.